This month Denmark’s biggest energy firm, Ørsted, said wind farms it is proposing for the North Sea will convert some of their excess power into gas. Electricity flowing in from offshore will feed on-shore electrolysis plants that split water to produce clean-burning hydrogen, with oxygen as a by-product. That would supply a new set of customers who need energy, but not as electricity. And it would take some strain off of Europe’s power grid as it grapples with an ever-increasing share of hard-to-handle renewable power. Turning clean electricity into energetic gases such as hydrogen or methane is an old idea that is making a comeback as renewable power generation surges. That is because gases can be stockpiled within the natural gas distribution system to cover times of weak winds and sunlight. They can also provide concentrated energy to replace fossil fuels for vehicles and industries. Although many U.S. energy experts argue that this “power-to-gas” vision may be prohibitively expensive, some of Europe’s biggest industrial firms are buying in to the idea. Heavy water use, threats of tainted groundwater, and artificial earthquakes are but a sampling of the environmental side effects that have tarnished North America’s recent boom in natural gas production via hydraulic fracturing or fracking. No surprise then that in European countries such as the U.K. that are looking to frack for cheap domestic gas, the environmental protesters often arrive ahead of the drill rigs. The Arctic is melting faster than predicted. Is now the time to shut down the low-carbon nuclear power plants in France — the 20th Century’s staunchest proponent of nuclear energy? Is natural gas produced via hydraulic fracturing or ‘fracking’ a gift that is buying time for a transition to renewable energy or a curse that reinforces fossil fuel dependence? Will carbon belching heavyweights such as the U.S. and China ever get serious about cleaning up their energy systems? Is Gas Fracking Inducing Earthquakes? Fracking for natural gas, whereby gas-trapping rock formations are blasted open with high-pressure water and chemicals, has prompted serious concerns over the safety of groundwater supplies. But another risk is gaining profile: the potential for inducing nerve-rattling microseismicity or, potentially, unleashing a quake of truly destructive magnitude. Like the magnitude-5.6 quake that rocked Oklahoma last weekend. Critics of carbon capture and storage (CCS) often deride the scale of infrastructure required for CSS to make a meaningful dent in global carbon emissions — not just in equipment to capture emissions at power plants (and other ‘point’ sources of CO2) but also in pipelines to move the captured CO2 to storage sites. 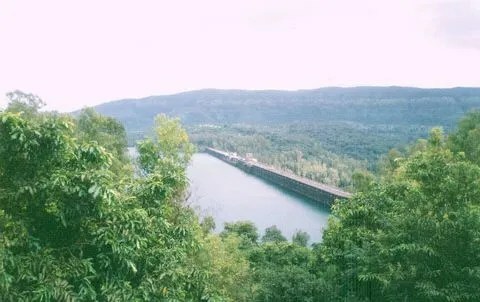 But an overlooked recent study by the Richland, WA-based Pacific Northwest National Laboratory (PNNL) makes a convincing case that, at least where pipelines are concerned, the scale of CO2 infrastructure required is well within the realm of current industrial activities. The PNNL study determines the feat is feasible not by taking issue with estimates such as Romm’s, but rather by projecting a realistic implementation path for CCS technology. The research, presented by PNNL senior scientist Jim Dooley at November’s 9th International Conference on Greenhouse Gas Technologies, first projects how rapidly CCS could grow in the U.S. under agressive climate policies. Then it compares the pace of pipeline construction implied with the historic evolution of natural gas pipelines. Between 11,000 and 23,000 miles of dedicated CO2 pipeline would need to be layed in the U.S. before 2050, according to PNNL’s estimates, in addition to the 3,900 miles already in place (which carry mostly naturally-occuring CO2 used to stimulate production from aging oil wells). 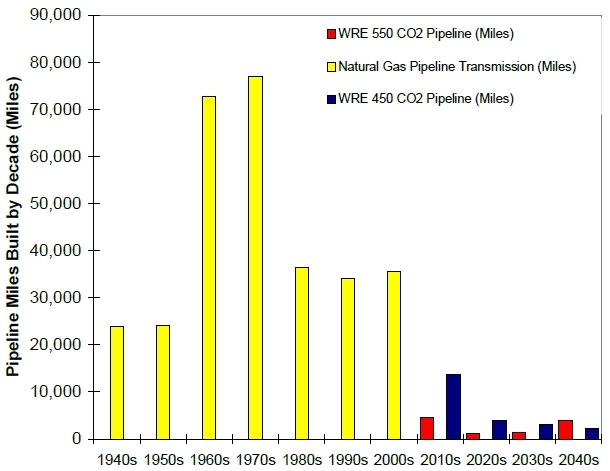 The attached graph from Dooley’s presentation breaks the projected CO2 pipeline mileage down by decade of installation (see red and blue bars), and shows just how puny it is relative to the U.S. natural gas network (yellow bars). Note that MIT’s 2007 Future of Coal report also compared CCS infrastructure favorably to natural gas pipelines. The MIT report estimated that capturing all of the roughly 1.5 billion tons per year of CO2 generated by coal- burning power plants in the U.S. would generate a CO2 flow with just one-third the volume of the natural gas flowing in the U.S. gas pipeline system. That scale is certainly immense. But so is the challenge posed by climate change.